I spent a few days in London earlier this month courtesy of Air New Zealand. The airline known for its series of cheeky “bare essentials” ads and in-flight safety videos and, most recently, its Hobbit-themed airplane, invited a small group of travel experts and journalists to fly as a focus group from Los Angeles International Airport to Heathrow. Our assignment for the “#NoLagtoLondon” trip: share our tried-and-true anti-jet lag tips and our “insider secrets” for arriving fresh and perky after a long haul flight. The work began in the Air New Zealand Koru lounge before we boarded the flight. 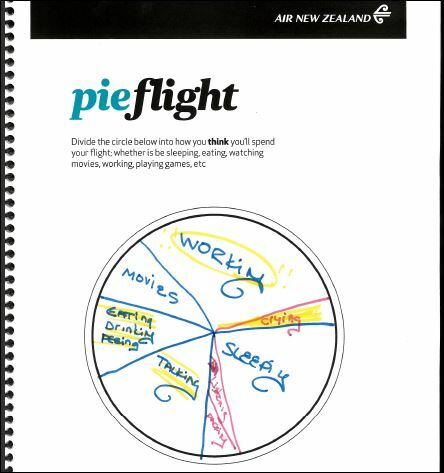 Workbooks and white boards were handed out and, among other things, we were asked to make a pie-chart of how we planned to spend the 10 hour flight. As you can tell, I had big plans for this flight: working, sleeping, chatting with my neighbors, eating, drinking (water only) and visiting the entertaining bathroom, which had both a mural of a chandelier and a real window. I also planned to watch a few silly, romantic movies that I’d missed in the theaters and I knew I’d end up getting a bit weepy watching them – even though I rarely react that way on the ground. During the flight the group was asked to read inkblots, write haiku poems and, finally, share our pre-flight rituals and our tips for making it through a long flight. Pre-flight rituals: pack (and re-pack), work late/tie up lose ends, create to-do lists and/or music playlists; send out trip details to friends and family members who might like to know what’s up. I’d prepared by eating extremely light for a few days before the flight and passing up all offers of liquor. I’d planned on getting a good night’s sleep on the ground before the flight so I could work and watch movies during the flight but ended up staying up late in my hotel room working. Dressing for a flight: most everyone was in favor of comfortable clothes that are casual and a bit dressy, although jeans seemed to be acceptable. I advocate layers that are easy to add or remove and, for ladies, no skirts that might ride up while you’re sleeping. Shorts on a plane? Pretty much everyone agreed that was a no-no. Arrival plans: our flight arrived late afternoon and everyone said they’d try to stay up as long a possible and go to sleep at a ‘normal’ time. Some folks did, but for the next two nights several of us were wide awake – and online, tweeting about it – at 2 in the morning. Jet-lag-wise, I was loser on this trip. I woke up at 2 am each night of the trip and one night just stayed awake – working and watching a BBC documentary about Tom Jones (!) till 4 in the morning. Still wide awake, I opened the bottle of red wine that had been left in my room by our hosts at the Mandarin Oriental Hyde Park London , a lovely and very swanky establishment not far from Harrods. A few sips and I was sleepy, so I put the glass aside and, of course, knocked it over on the cream-colored rug the next morning. And this is where I learned a lesson about top drawer hotel service. After spilling the wine, I panicked, grabbed a white towel from the bathroom and tried blotting up the wine. That did almost nothing except ruin a good towel, so I picked up the phone and called housekeeping to turn myself in. Within moments a supervisor was at my door and a minute later a man arrived with a machine for a spot cleaning. He didn’t scold. Instead he told me how smart I’d been for calling right away and not letting the red stain set. And, seconds later, so was he.